Being a college student means juggling both schoolwork and social life, and people focus a lot on making sure they are able to do both to the fullest extent. 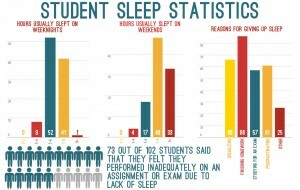 But with this most students are sacrificing an overlooked commodity: sleep. Personally I have had multiple nights of getting no sleep just during my first semester as a college student. With fraternity life and a somewhat heavy school schedule, I find that I am always feeling sleep deprived one way or another. of course I try and compensate with a lot of coffee, but that doesn’t change the fact that my body is running on very little sleep. But recently I have been thinking about the toll that sleep deprivation can have on one’s body, both in the short and long term sense. As expected, it turns out sacrificing sleep regularly will effect a person’s mood and perception greatly, which most of us have experienced or know someone who acts weird after pulling an all-nighter. But what I did not know was the detrimental long-term effects sleep deprivation can have. In this article, multiple studies are preformed to test multiple hypothesis about the effects that lack of sleep can cause. Although all these studies suggest a strong connection between variables being tested or observed, it is always important to remember that correlation does not equal causation and there is always a possibility of a false positive or that the results were due to chance. In the first study, an experimental study is preformed in which healthy patients are deprived of sleep for an unspecified amount of time. 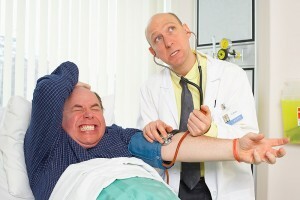 Afterwards the patients’ physical well being is evaluated and it was found that most patients suffered from effects linked to an increase in stress level, such as high blood pressure. This article here explains how when your body is experiencing more stress, it releases large amounts of hormones which increase the heart rate as well as constricting blood vessels, causing blood pressure to increase above your body’s normal rate. What the study does is points out how the putative casual variable (sleep) correlates to an increase in the putative response (blood pressure), which can be used to measure stress. Although this study may seem straight forward, there is most likely a decent chance that the increase in blood pressure could be due to a cofounding third variable that was not taken into account during the study. But just from personal experience, the outcome of the experiment seems to be realistic as I am definitely more stress and anxious after a night of few hours of sleep. In a different observational, or correlational, study preformed by the same group, they were able to make connections between sleep deprivation and many diseases such as heart disease, obesity, alcoholism, and even decreased life expectancy. This shocked me to see that this study suggested so many diseases could be more prevalent in people getting less sleep (less than five hours a night), but it reassured me to read that the people being observed had been suffering from sleep deprivation for most their life. These studies have made me more motivated to get to bed earlier, because although they may not been the most well-done experiments or observations, they supply enough data to support their hypotheses. But aside from health effects, the more immediate consequence is that these effects of sleep deprivation typically have college students decrease their academic performance. This really influenced me the most, because it made me realize that my late nights of studying are making my grades worse.